according to the grace given to each of us." Rev. 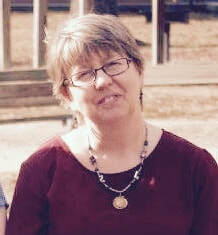 Jennifer Newell joined our staff in 2007 as Director of Family and Children's Ministries. In 2013, she was hired as the church's pastor. Jen has a degree in Economics from UT Chattanooga and completed the requirements for ordination though the PAS program. She serves on the Cleveland Homeless Task Force and on the Board of Directors for The Refuge. In her spare time, Jen enjoys CFC soccer games, thrift store shopping, photography, writing, and cooking/eating breakfast of all kinds: bacon, gravy biscuits, french toast, bagels, frittatas, granola: it's all good! She and her husband Chuck are parents to Ellie, Evan, and Zoe. "Presbyterian" describes a form of church government where decisions are made by elected representatives. Those representatives are called "elders," but they aren't necessarily old! Elders can be any age, and leadership positions are open to women as well as to men. ​Our elders serve three-year terms on the ruling body, which is called the Session. The Session meets once a month to do church business, and our ruling elders help with pastoral responsibilities as well. Churches within a particular geographical area are organized into Presbyteries. All ministers plus elected elder representatives from each congregation meet twice a year to do Presbytery business, which includes work on shared ministries and mission efforts, oversight of pastors and candidates for ministry, and assistance for churches who are in need.